To top it all, the Hochkönig area is also part of the enormous Salzburg Super Ski area. This region covers other top Austrian ski areas such as Kitzbuhel, Saalbach/Hinterglemm, Zell am Zee, Kaprun, Obertauern, Zillertall Arena and includes over 2500km of piste and over 750 lifts. The Salzburger SuperSki pass is available as an alternative to the Hochkönig or Ski Amadé pass. We are confident that Hochkönig will become your preferred destination for ski holidays with family and friends. Breathe in the crisp alpine air and marvel at the mountain panoramas while cross country skiing on the perfectly prepared trails. Ski Amadé offers 714 kms of cross country trails through an amazingly beautiful mountain landscape. Even though cross country skiing is an endurance sport, at Ski Amadé both beginners and experts will find perfect conditions. Maria Alm in Hochkönig also offers a night trail. In high season on Wednesdays, you can go into the mountains during the evening. The Tiergartenalm and the Zapferalm keep their doors open, so you can enjoy a nice meal or a drink. Ski touring in the Hochkönig region is a marvellous experience! The possibilities for touring are numerous: sunset tours and ski tours under the starry skies are offered on select slopes, guided ski tours on the Hundstein (Europe’s highest grass mountain) and huge areas where you can carve down deep snow-covered slopes alone and away from the hustle and bustle. And all of this is offered in the middle of an unparalleled mountain panorama. With 400 hotspots, the free WiFi provided by Ski Amadé covers almost the entire region. The best reception is usually available in lift stations and mountain lodges, close to the hotspots. Skiline is an unique and innovative way for you to review your day’s skiing. You can obtain your personal diagram showing altitude difference, the lifts you have used and distance travelled in just a few seconds by entering your ski pass number. Be one with the nature and explore the groomed winter hiking paths. Hiking or snow shoeing will unravel the magic of Hochkönig’s Winter Wonderland. With snow shoes, you can explore the untouched nature away from the pistes and gather unique impressions. Tours in varying degrees of difficulty and lengths are available throughout Ski Amadé. The routes are generally well signposted and therefore ideal for all levels of fitness. Tobogganing is a great experience for both young and old. From a romantic sledging trip under the stars to great fun with all the family, everything is possible and you should definitely make sure not to miss out on a tobogganing trip on one of the many natural runs. The toboggan runs go through picturesque winter landscapes and past unique backdrops. Many toboggan runs are floodlit and have their own toboggans available to hire. The toboggan run near Hochkeil (10 minutes drive from the Wanderfalk Lodge) is a natural 4.5 kms run and is one of the longest runs. It starts near Alpengasthof Kopphütte. What better way to explore the Fairytale alpine landscape by riding a Horse pulled carriage! Make your kids feel like prince /princess or simply share this unique experience with your loved ones. For reservations contact: Elmaugut farm, Family Höllwart (+43 6467 7290) or Kniegut farm, Family Koblinger (+43 664 1442164). Apart from these you can enjoy many more winter activities such as Ice Stock (Ice Curling), Ice Skating, Fat bike tours, Geocaching or of course a relaxing day in the many Thermal Spa’s in the surroundings. 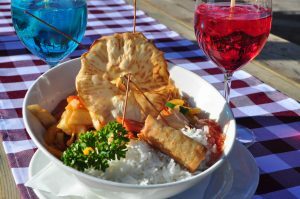 The Ski Huts in Ski Amadé offer great Austrian cuisine and outstanding local wines & spirits. Hochkönig is Austria’s only Vegan Certified region. 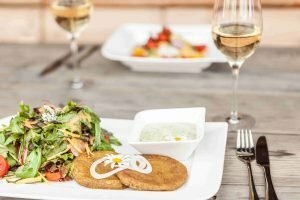 Select ski huts, restaurants, hotels and bakeries serve Vegan food and drinks. 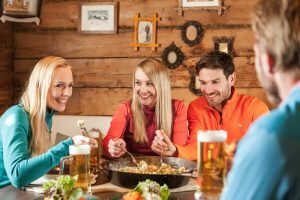 Relaxed atmosphere, great Austrian finger food and Cocktails provide the perfect setting for watching magnificent sunsets at select Ski huts. Explore the Winter Wonder of Hochkönig!